I have Deborah Madison’s Vegetable Literacy home from the library at the moment. 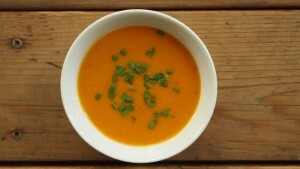 There is a recipe for “Butternut Squash Soup with Coconut Milk, Miso and Lime.” that looks delicious. I had several of the key ingredients around here, but improvised to such an extent that I can’t say I’ve actually made the recipe. 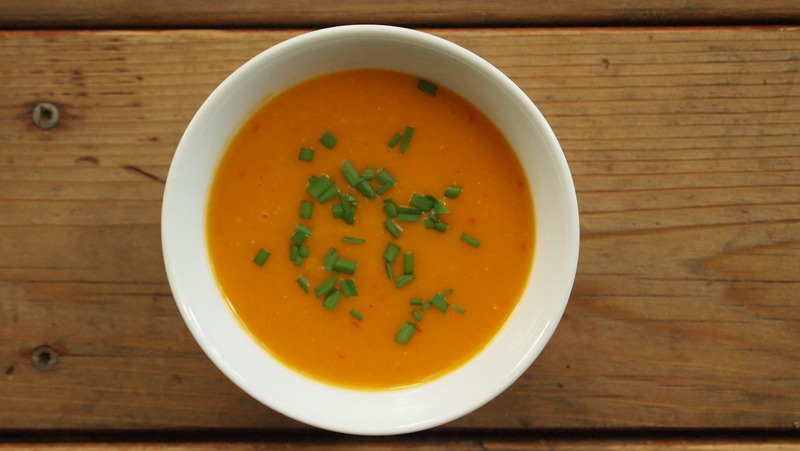 So here is my simple, rainy Saturday take on butternut squash soup. Perhaps next weekend I’ll make the real deal. Roast the butternut squash according to your favorite method. This step can be done a day or two ahead if its convenient. Heat the sesame oil over medium heat. Saute the onion and ginger until softened, about 5 minutes. Stir in the cooked butternut squash and coconut milk until well mixed. Stir in water until desired consistency, about 1 cup. Add harissa paste to taste. Allow soup to simmer for 10-15 minutes. Blend soup until very smooth. Mix the lemon juice and miso together then stir into the soup. Allow to cool slightly then top with a green garnish of your choice before serving. 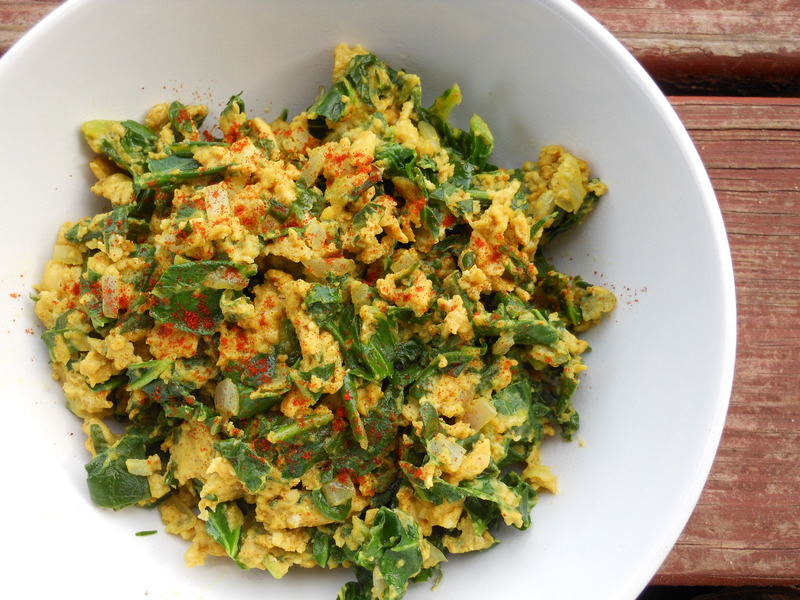 My friend Sue taught me to ma ke a version of this salad a few years ago in Portland. 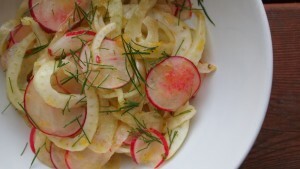 Its one of my favorite spring salads and is the first thing I think to make when I see fennel at the market. Combine fennel, radishes, and lemon zest in a medium bowl. Whisk together lemon juice, a pinch of salt, pepper and olive oil. Pour over veggies and let rest 30 minutes or more. Adjust salt to taste and garnish with a few fennel fronds. I suppose I have a risotto for all seasons. This one is just right for a cool, rainy spring evening in Austin; comforting but bright and summery. The base is sweet onions just harvested from my garden. Pulling 50 beautiful little onions out of the dirt is a great way to celebrate the end of another semester. Cooking up recipes full of them is a great way to celebrate being on vacation. Heat vegetable broth and keep at a low simmer. Melt butter in a large shallow sauce pan over medium low heat. Saute sweet onion till translucent, about 5 minutes. 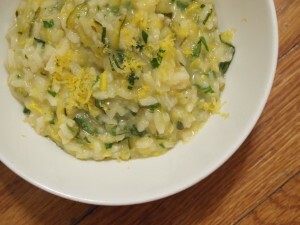 Add garlic + summer squash. Season with salt, depending on how salty your veggie broth is. Cook for a few minutes more, until the squash just begins to soften. Add rice + toast for a minute. Add wine + stir. After all liquid is absorbed, add about a half cup of vegetable broth. Stir frequently until liquid is absorbed. Repeat until all broth has been added and rice is tender and mixture is creamy. Stir in basil + parsley. Serve in shallow bowls garnished with plenty of lemon zest. Serves 4 as a substantial side. 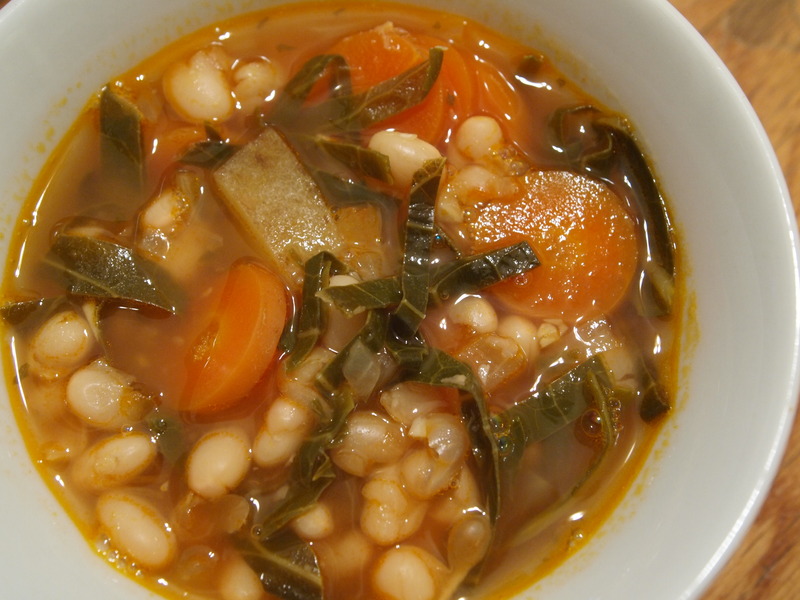 I loved my grandpa’s navy bean soup as a kid. This is a vegan twist on the original with smoked olive oil for richness + collard greens in place of celery. Its perfect with glass of red wine for a very satisfying winter meal. *If you use canned beans, don’t add salt until the end of cooking so the beans cook the whole while + get very tender. I always pressure cook my beans. It yields a far better texture in a fraction of the time of stove top cooking. Its easy to pressure cook a big batch + freeze a few two cup containers for easy same day use. No need to ever buy another can of beans. 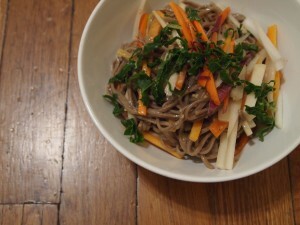 Cook soba noodles in boiling water till just tender then rinse under cool water. Mix tahini, tamari, sesame oil, rice vinegar, honey + sesame seeds in a small bowl then toss veggies, noodles + sauce together in a larger bowl. Serves 3-4. For a main course, top with a poached egg or some spicy or simple baked tofu. Whisk all dressing ingredients together + mix with veggies + fruit in a large bowl. Allow to marinate half an hour+ then serve. Heat oil in a cast iron skillet over medium heat. Saute onion, garlic + ginger till fragrant, about 2 minutes. Add collard greens. Saute until just tender + bright green, about 5 minutes. Add curry powder + stir. Add eggs + stir frequently until just cooked. Season with sea salt + serve with a dash of hot paprika. *This is a pinch outside of our traditional family recipe, but I’d say a delicious little deviation. To my family, don’t worry… I made a perfectly traditional green cabbage version right along side while I was at it! Heat a few Tbs oil in a large skillet. Add cabbage + saute until nicely browned. Set aside while preparing haluska. Mix grated potato, flour, egg + salt in a medium bowl till well mixed. Dough should be pretty damp, be careful it doesn’t become too stiff. Pile dough onto a plate + cut small chunks, about the size of a dime into hot boiling water. Cook for about 7 minutes, until haluska float. Scoop haluska from water as they cook + float to the top. Keep warm till all haluska are cooked. Mix with cabbage. Serve with small bowls of sea salt + sugar on the table depending on your guest’s preference. Serves 4 a very hearty meal. Heat vegetable broth in a small pan to a simmer. Keep over low heat. Melt butter + heat olive oil in a large shallow pan over medium heat [15 quart saute with 2″ sides is perfect.] Add onion, season with salt + saute for about 5 minutes. Add garlic, butternut squash + a bit more salt, then turn up the heat slightly and cook 5 minutes more, stirring infrequently. Add rice + toast for about two minutes, stirring frequently. Pour in wine + stir frequently until liquid is absorbed into rice. Reduce heat to medium then add hot broth about 1/2 cup at a time to the rice + vegetable mixture, stirring frequently. Add the next half cup when all the liquid has been absorbed until you have added all 4 cups + rice is tender. Stir in arugula + Mexican Mint Marigold. Allow to stand 5 minutes before serving on a bed of arugula leaves. Steam chopped potatoes + sweet potatoes in separate batches until just tender, 10 – 15 minutes. Be careful not to over cook so the skin does not separate from the rest of the tuber. Allow to cool. Dissolve salt in water + vinegar. Whisk in honey + oil + season with pepper. 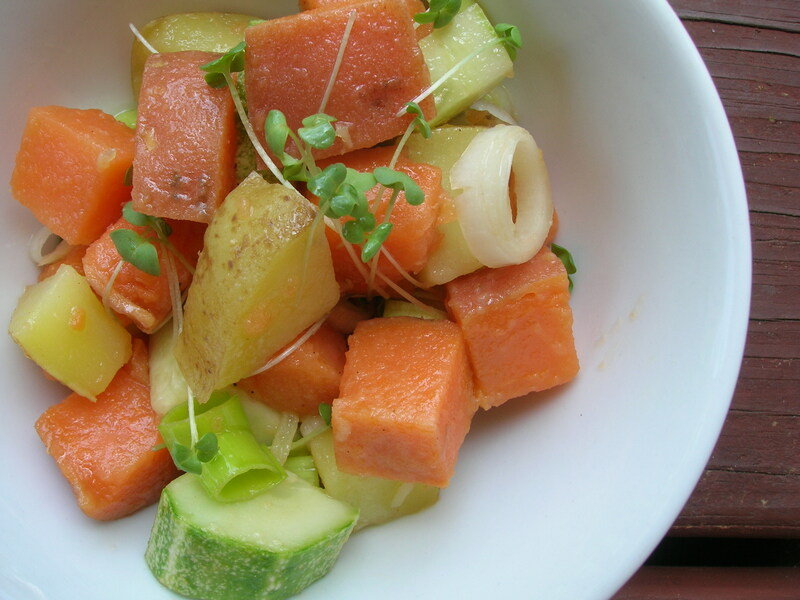 Combine all sweet potatoes, potatoes, cucumbers + leeks in a large bow + toss with dressing. Gently stir in the mustard sprouts. Can be made ahead + great the next day. * Mustard sprouts are a delicious little spicy sprout that tastes just like, you guessed it, mustard. To grow at home, simple sprinkle a layer of seeds on top of a small pot of soil + water. Cover with a damp paper towel until the sprouts emerge, then give them a pinch of water a couple times daily until they are about 2 inches tall, about 5 days. You can find mustard seeds for mere pennies in the bulk spice section of good grocery stores like Whole Foods or a local Co-op. 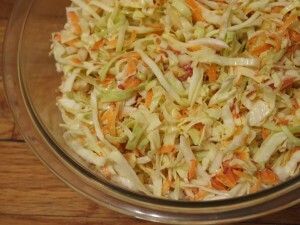 You could always whisk a tablespoon of Dijon or whole grain mustard into this dressing if you don’t have sprouts on hand. * Inspired by my favorite sweet potato salad from Moosewood Cooks at Home. Delicious vegetarian, lactose free, and seafood recipes made from whole, natural ingredients. Local + seasonal recipes inspired by a winter in San Francisco, a rainy spring in Portland, OR + the never ending sunshine of Austin, TX. Ingredients are from the local farmers market, the nearest body of water, or the backyard garden. Enjoy! © 2019 food.lainehardy.com. All Rights Reserved.